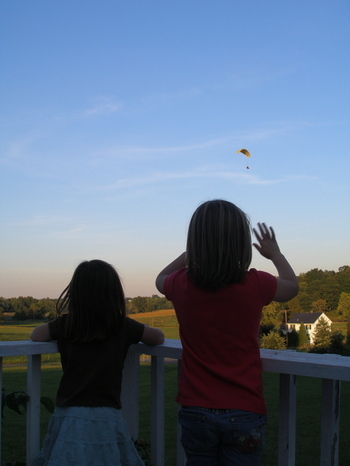 waving to the "flying banana" as he’s known in our family. even my grandmother called up, "are your girls outside? the flying banana is here!" He flies this thing around with what looks like a glorified box fan strapped to his back. I’m not sure how he does it….but he does put on quite a show. I know this is nothing new, but I’ve never done it before and man, was it fun. 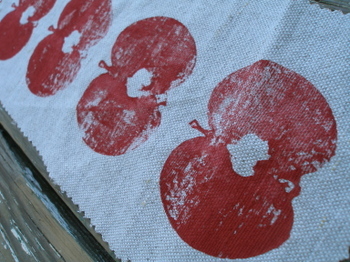 The girls and I made apple prints yesterday on some scraps of linen. They went crazy when they lifted up that apple to see the first print underneath. (I kinda did, too.) We couldn’t stop ourselves. There are scraps of apple-stamped fabric hanging around all over the house. We also made some applesauce yesterday, too. It’s hard to make the picture look as good as it tasted. Yum. Can you tell we just finished up our short vowel sounds? a-a-apple? what a fun day, what will you do with those adorable prints? Also, love your little bowl. My mom had a platter that matches that set that I stole the last time I was home. With her permission, of course. Did you use fabric paint, or just regular paint for your apple prints? oh the apple prints are lovely!! Those apple prints are cool!! i really like the whole apple print idea!!! LOVE that bowl. The apple prints are lovely!! Now I have that song stuck in my head thank you very much! Love those apple prints – something else I’m going to have to try! love the prints….we may have to try that, too. and homemade applesauce is one of my favorite things. enjoy! 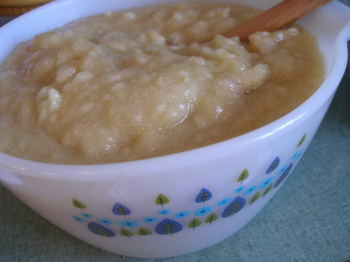 I have been making homemade applesauce, too. it is so yummy. last night we opened a jar of store bought applesauce and my son said, “this doesn’t taste like moms!” i smiled…it’s nice to know that you are appreciated. cute! I want to make some now! what a fun project! i can’t wait to hear more about your homeschooling. my daughter is only 3 1/2 but i’m considering it as well. i’ve done a ton of reading lately and it’s been so inspiring. so is your blog–i came over from a link on twostraightlines (love that one too!). The apple prints look geat, especially on that fabric! Our “flying banana” is green but the kids love to see it in the sky. It flys over the soccer field when all the kids are practicing and the kids jump up and down and wave. I’ve given you the ‘great tip award’ over on my blog. be sure to check it out & pass it along! Those apple prints are awesome! How great is it that apple season comes in September? We have been doing the same thing with apples! 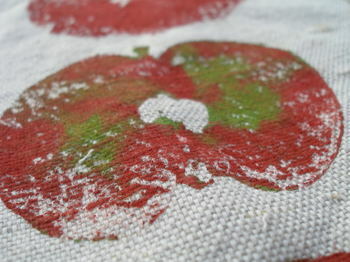 I love the apple prints on the linen! You could make a skirt or smock. Very cute! Love the apple prints (and the dish that the apple sauce is in)! Oh, I WISH my kids liked applesauce. It stinks to just make one helping of it–lots of work. Love the prints. Never thought about doing it, but am going to have to try it now. We’re going to two apple farm get-togethers next week!